I can relate to being so far away from your loved ones (I live on the East Coast, they live on the West), and how important it is to find the time—and proper price tag—to get together. I’ll put on my very best fedora and help you and your daughter reunite in the British Isles. First off, spring is a great times to go budget-wise, but may not be the best weather-wise. If you can handle getting a wee bit wet—it wouldn’t be Ireland or Scotland without a little (or possibly a lot) of rain—then you can save on hotels and vacation packages, as well as avoid any major crowds who may fill the cities during the high summer season. There are several ways you can plan your vacation: book airfare, hotel, and transportation independently, which may save a little extra cash, but not time; or book a bundled vacation package that takes the hassle out of planning, but also can take some of the spontaneity out of the open road. There’s a little trick I will share with you that makes it easy to decide which route might be best to follow when booking. Begin by comparing airfares to get a base price. I found round-trip tickets from New York City to Dublin starting at $654 per person (with taxes and fees) in May. I realize that New York City may not be your departure city, but it is typically one of the cheaper cities to depart from when crossing the Pond. From there, search vacation providers like Sceptre Tours, go-today.com, and EuropeASAP for deals to your destination. I priced an Emerald Package through Sceptre Tours starting at $599 per person (without taxes and fees) in May. The deal includes round-trip airfare from New York City (other departure cities are available at a higher price), first-night hotel in Dublin or Shannon, five nights at farmhouse B&Bs, daily Irish breakfast, and a seven-day standard car rental. When you compare the price of the package to the cost of airfare, it’s obvious the package is a better deal than trying to book each individual part separately. If you feel a little hesitant about booking a package because you don’t want everything planned out, you needn’t worry. This deal comes with five nights of B&B vouchers, which give you the freedom to choose where you want to stay as late as the night before your arrival. This means you can travel at your own speed and let the road take you where you want to go. By traveling in the spring shoulder season, you’re also much more likely to have your pick of B&Bs as well, as occupancy rates are lower than in peak months. 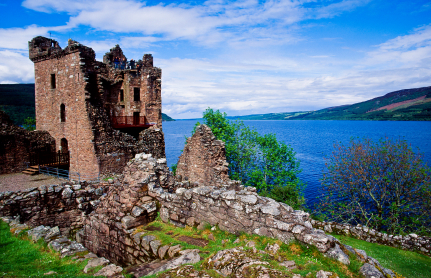 Sceptre Tours also offers a Scotland Tartan package starting at $969 per person (without taxes and fees) in May. The deal includes round-trip airfare from New York City (other departure cities are available at a higher cost), first night at Jury’s Inn in Edinburgh or Jury’s Inn in Glasgow, five nights at Discover B&Bs, daily Scottish breakfast, and a seven-day standard car rental. I priced round-trip airfare from New York City to Edinburgh starting at $716 per person (with taxes and fees) in May. Even with the additional taxes, the tour is a better deal, because a car rental and six-nights’ accommodations would wind up costing more than the total price of the package. The package prices for both destinations are a better deal than the cost of booking everything separately. However, this isn’t always the case, and it pays to keep one eye on deals, investigate, and compare prices. For your trip, I think either package would be a great way to reconnect with your daughter while exploring the beauty of the the British Isles at your own pace. As for my other readers: Do you have a suggestion for Kathleen on how to save money on a trip to Ireland or Scotland? Have you found ways to cut costs in your online research? Or do you have a tip on places that might be fun to visit for the mother-daughter duo? Please leave your comments below.